As a member of Master Builders Queensland, Foundation Solutions live up to that name by providing outstanding foundation and underpinning services to all our clients. We also enjoy working with like-minded companies in the building industry who are great at what they do and strive for the best outcomes for their clients. As such, we developed a special service for our fellow Master Builders to help them out when they have foundation problems to deal with - for example on a recently built home that is showing signs of foundation movement, or on a renovation project that needs the foundation assessed prior to commencing any works. If you’re a builder dealing with a complaint for a structural or foundation defect on a home that is within its warranty period, you’re going to want to get to the bottom of the matter quickly. You need to understand the extent and cause of the claimed defect, as well as where responsibility for resolving the matter lies. Similarly for a home renovation, a builder may require structural clarification on a home with dubious foundations. There are a few compelling reasons for a builder to get an expert assessment of a building - even where fault does not lie with the builder, or where the defect is within acceptable limits - such as to maintain brand reputation and reduce exposure. On site conducting an Underpinning Appraisal. To avoid unnecessary pains and get clarity on your exposure, builders are best off solving these problems quickly, with the help of experts where needed. That’s where we come in. 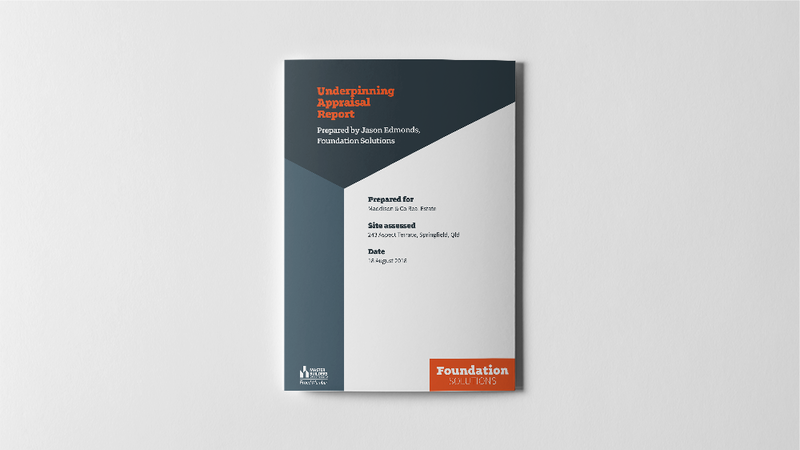 Foundation Solutions has a service just for our fellow Master Builders - a free underpinning appraisal report that will provide clarity on the condition of the building and enable better decision making by all involved. The Underpinning Appraisal Report, our free service, customised for our fellow Master Builders. Our service involves a full assessment of the property – inside and out – to determine the extent of the structural problem due to foundation movement. We provide recommendations for further action where required, including forensic engineering and underpinning, and a fully costed assessment to restore the house. This is delivered in a professional report that becomes a useful tool in the dispute process, provide clarity and certainty for all parties. And we do it all for free, with no further obligation on the builder or their client. If you’re a master Builder and this is of interest to your company, please don’t hesitate to get in contact with us. Getting an Underpinning Appraisal Report done is as simple as calling our team and booking in a time for us to conduct the site visit. We can meet a representative of your agency at the address, or meet the owner or tenant without you if preferred. Once we’ve completed the appraisal, we send you the final report including a costed assessment and will remain available to answer any questions you have or assist with further services. We usually are able to complete an underpinning appraisal within 1 - 2 weeks from the date of booking, depending on our work schedule. Once we’ve completed the site inspection, we deliver the report within 24 hours. We service the South East Queensland region, including Brisbane, Ipswich, Sunshine Coast, Gold Coast, Toowoomba and everywhere in between. We are confident we offer the best underpinning service in Queensland and are prepared to let you experience this first hand at no cost through our appraisal service. We are Master Builders and we love showing people that foundation problems don’t have to be scary. We’ll provide you and your clients with trustworthy, transparent advice that will help the property sale go more smoothly for everyone involved. As part of our Underpinning Appraisal Service, we even take levels, to provide greater accuracy and certainty over the condition of the foundation. If this service is of interest to your company, we’d love to hear from you and to find out there’s anything else you would need as part of this underpinning appraisal service. How much should underpinning cost?